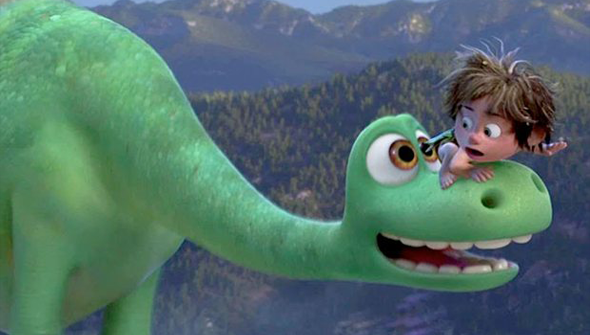 Pixar's The Good Dinosaur is forever doomed to be overshadowed by it's critically lauded immediate predecessor, as it had the misfortune to come out in the same year as Inside Out. Yet while Pete Docter and Ronnie Del Carmen's film has been hoovering up awards all over, The Good Dinosaur has not been so lucky. Director Pete Sohn and team can take some comfort though, as their film was the big winner in the animation category at the 14th Annual VES Awards. The ceremony is held by the Visual Effects Society and rewards excellence in visual effects of all kinds. Despite Blue Sky's Peanuts Movie having the most nominations in the animation category, Pixar dominated on the night. The Good Dinosaur took home three of four awards it was eligible for: Outstanding Effects in an Animated Feature, Outstanding Environment, and Outstanding Effects Simulation. Inside Out won the remaining category, Outstanding Animated Performance for the character of Joy. The VES awards (like many other awards we can name) have been long dominated by Disney and Pixar (Big Hero 6 swept the board last year). It's interesting to see The Good Dinosaur be in the lead, however as it puts into focus how these awards are interested in pure technical achievement. And even The Good Dinosaur's harshest critics were known to recognise it was brilliantly animated and a technical marvel. Outside of animation features, Star Wars: The Force Awakens won four awards for its effects, and Game Of Thrones was the big winner in TV.